Good puzzle games are difficult to come by. Having the right balance of challenging puzzles, while not being too frustrating, is a difficult thing to achieve. Zachtronics, however, have really nailed this formula. They’ve created some of the most intriguing, creative, and most importantly FUN puzzle games of the past few years. Games like Opus Magnum and SpaceChem have been received with overwhelmingly positive reviews and are thought of as some of the best puzzle games out there today. My personal favorite of the games that Zachtronics have created is TIS-100. 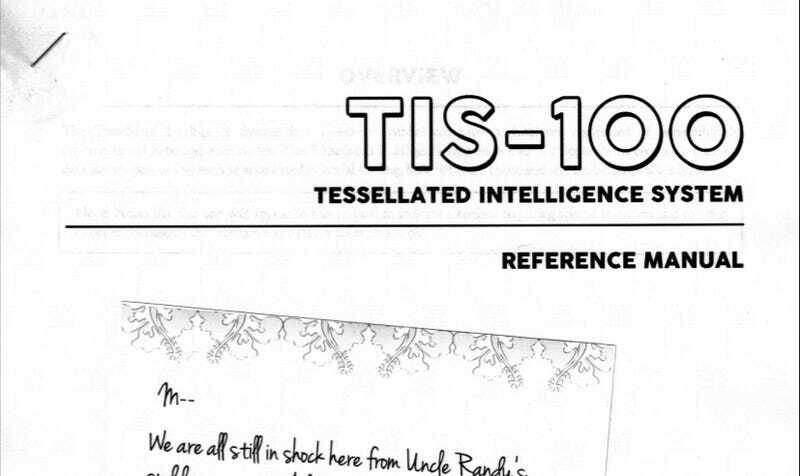 TIS-100 is short for Tessellated Intelligence System 100. It is a minimalist assembly programming puzzle game in which you fix corrupted segments of code to repair the TIS-100 computer. One quirk I’ve always liked about TIS-100 is the need to refer to a manual that’s given to you with the game. You can either print it out or view the PDF copy, but you will be needing to refer back to it while solving puzzles to learn the functionality of the TIS-100. The puzzles start off rather simple, giving you an input and asking you to move it to the output. Using its unique pseudo-assembly code, you take parse the input appropriately and move it where it needs to go. Further into the game, the difficulty increases, asking you to perform mathematical operations or output only certain specific numbers. As you go through them, you’ll become familiar with the structure and the mindset required to solve the puzzles. The puzzles give an incredible satisfaction to finish and really give the feeling of accomplishment after beating a level. It’s definitely a game I’d recommend to anyone who likes programming or puzzle games. While what you do in the game isn’t real programming, it gives the same feeling and you really learn how to think algorithmically as well as problem solve like a programmer. The puzzles are never too difficult to solve and the satisfaction of solving them on your own is incredible. TIS-100 is only $6.99 on Steam and goes on sale often, so if any of this seemed interesting to you, I highly suggest you pick it up!